Hey, do you know my friend Inspiration? She’s great fun. When she comes to visit we have an amazing time. Were a good team, she and I. We are amazingly productive together when she shows up, always creating new work like crazy, generating wonderful ideas, and moving in new directions. I love the feeling of having her around. She makes me bold and confident, not caring what’s going on in the world around me. Could there be a better friend? There’s one problem with Inspiration though, and it’s a big one. She’s flighty and unpredictable. She doesn’t show up when it’s convenient and she’ll leave suddenly without warning. No matter how much you beg or plead, when she’s ready to go, she’s gone. If she wasn’t so much fun to have around when she came to visit, I’d probably end my friendship with her. I mean, who really wants a friend so fickle? But I know what she does is not intentional. It’s as much me as it is her. You see, if I don’t give her my attention, she’ll move on. If I think I can delay her departure by saying, “I can’t right now, hang on until tomorrow,” I’m deluding myself. She doesn’t have time for that, she’s got other people to inspire. If I don’t drop everything and take what she has to give, I can’t expect her to hang around indefinitely. But I often do just that. Inspiration comes to visit and I say, “No thanks, not right now. I’ve got other things on my plate.” I forget what a great team we are, how much fun we have. I forget that I may not see her for a while, if I say no. I forget that it’s my choice, in the end, whether Inspiration comes to visit. I might not have any control in when she shows up, how long she stays, or what we do while she’s here. But being open and willing and inviting her through the door… That’s all me. She’s gone from here for the moment. Hopefully she’s having a grand time with you right now, since she’s not with me. I miss her, but her absence helps me realize that next time, I can’t put her off. I’ll rearrange my schedule and invite Inspiration in. I’m on a roll these days. 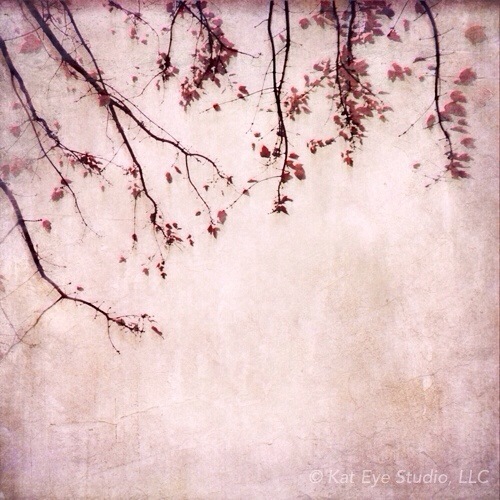 A roll creating imagery filled with delicate branches and fading leaves. It’s my own personal quest… Can I create just one more? Can I convey the grace and beauty of this transitory time? Can I create another piece that touches my soul? Maybe touches another’s? Sometimes the thought pops into my head, I shouldn’t share yet another image like this. People will get bored. I remember feeling that last year with my bare trees too. But out of that came a body of work, Treescapes. Out of that came a more cohesive vision than I’ve had before in my photography. So… maybe a fascination with something is really needed to develop vision. The desire to try to create just one more piece with a specific subject, a specific technique, a specific feeling isn’t so wrong. I only need to look to the great masters, painters like Picasso and Van Gogh, to see they repeated themselves. They would often paint and repaint the same subject and scene, varying things slightly to see what happened. Why do I feel I shouldn’t do the same? Maybe I’ll reframe it… I’m not repeating myself, I’m exploring the theme. I’m seeing how far I can take it. And when I get bored with it, I’ll move on. 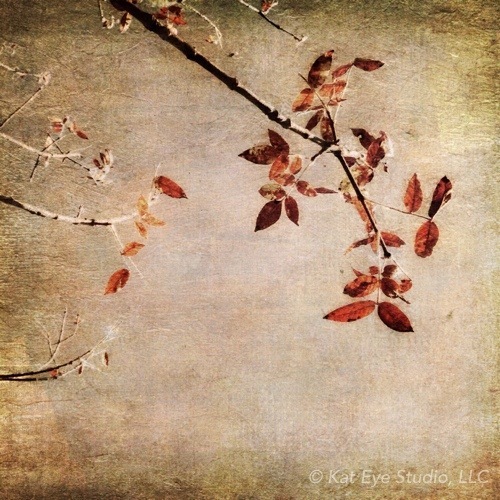 Until then, there are still branches with leaves to capture, for a little while yet. Then there are branches without leaves, too. Oh yes, I’ve noticed them. Their time will come. What about you? Do you worry about repeating yourself, or do you follow your fancy even if it leads to the same place every time? Where do you think this idea that we must create something “novel” every time comes from? 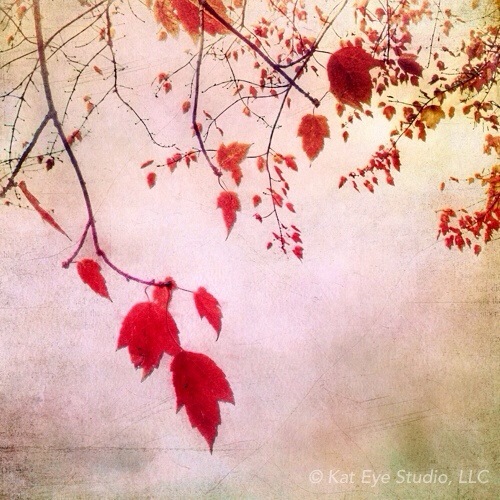 At an ever-increasing pace, I’ve been fielding the questions: Are you going to create a Smartphone Art eCourse, Kat? When? 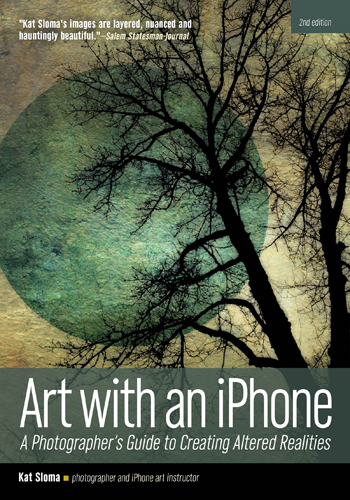 And the answer is: YES, definitely, I’ll be offering a Smartphone Art eCourse in 2014. Sometime in the first half, is my plan, but I haven’t penciled out dates quite yet. 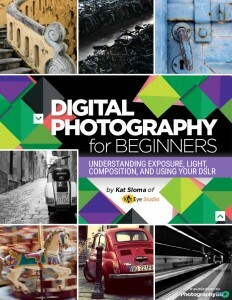 I’m excited there is so much interest! But what to do until that time gets here? You can use the Smartphone Art series on the Seek your Course blog as a teaser. 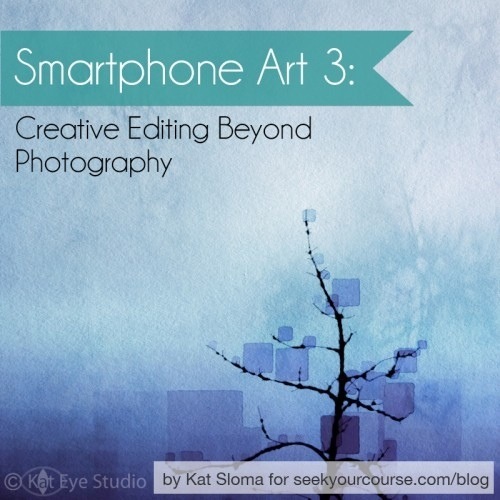 The third and final installment, Smartphone Art 3: Creative Editing beyond Photography is now available. In this episode, I walk you through how to blend the output of multiple apps to create a unique work of art. To me, this is the most fun part of creating Smartphone Art! Come on over to read the article and then try it yourself. 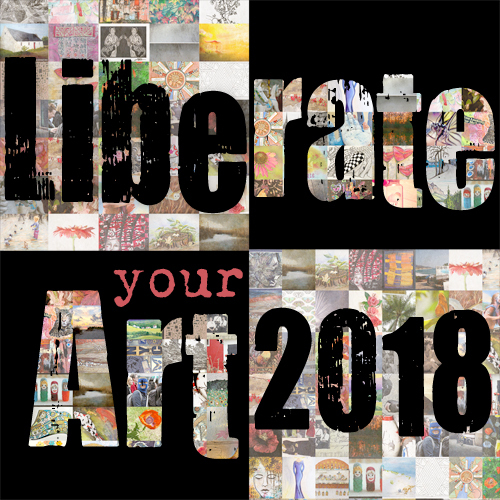 That’s the best part in all of this: Making art accessible. YOU can create Smartphone Art, too! It seems I’m not the only one who is not ready to let go of fall yet. Not only did I receive a lot of comments here yesterday in agreement, but I heard it from my family as well. We set up the Christmas tree last night and none of us felt ready. It’s very odd, normally it’s a day-after-Thanksgiving tradition to excitedly decorate for Christmas in our house. I wonder what’s going on? 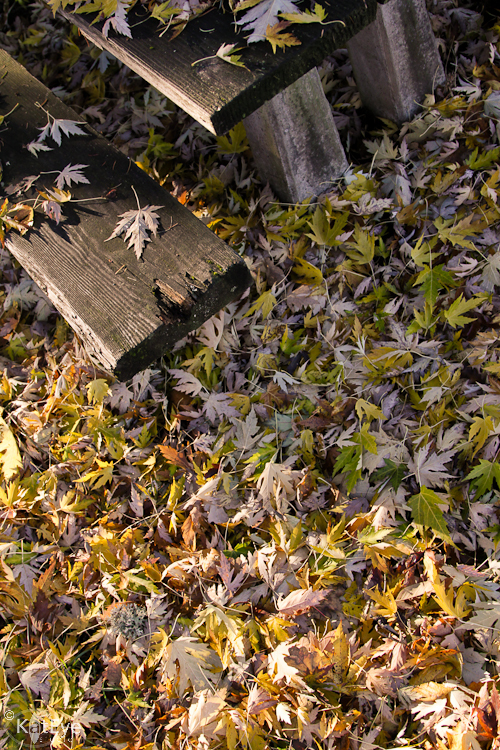 In the meantime, while I search for an answer to that question, I’ll keep sharing my fall images from the weekend. 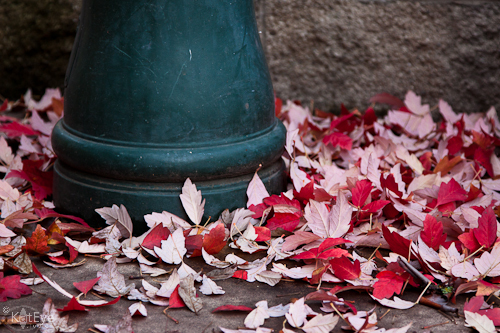 I loved these leaves, all piled up next to a lightpost, in Ashland, Oregon. The colors are great, as are the shapes – they are dry! Where I live in Oregon, you don’t see these kind of leaves too often. They are usually all wet and glued together from the rain. 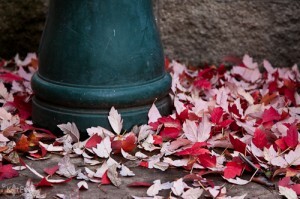 They are still pretty, just not perky like these leaves. I love how the strong color peeks out here and there. 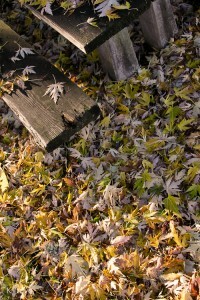 You can visit me over at Mortal Muses today, writing on gratitude. Come see what I am most grateful for! After a delightful Thanksgiving with friends, we packed up our trailer for a weekend away. As we explored a few of the small towns in Southern Oregon this weekend, I started to capture the holiday lights and the Christmas displays. But when I looked at my photos this morning, I decided I’m not quite done with fall. Not just yet. 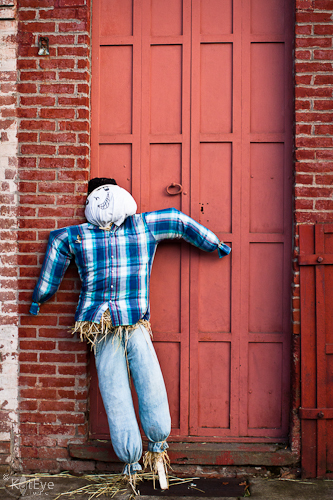 So today you get this happy grinning scarecrow, to extend autumn just a bit longer. I am grateful for the abundance I see in life. An abundance of leaves and light. An abundance of beauty that exists around us, everywhere, every day. An abundance of connections, sharing friendship and love. I am grateful that I can capture this abundant beauty with my camera, and that it helps me connect with all of you. Regardless of where you are in the world and whether you celebrate this US holiday or not, I am wishing all of you a day of beauty, abundance and gratitude. Thank you for being here.